What’s so SPECIAL about SPECIALTY contact lenses? Your prescription is too high for contact lenses. You have a corneal disease or condition that will not allow you to wear contact lenses. You have had eye surgery, so contact lenses are no longer an option. Your eyes are too dry for contact lenses. If you answered “YES!” to any of these questions, it is very likely that you are one of the thousands of patients who could benefit from a specialty contact lens design. 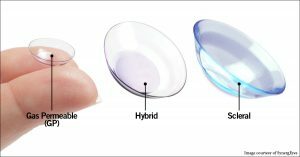 Specialty contact lenses come in many different designs and materials, which include small and large diameter rigid gas permeable lenses, soft contact lenses, and hybrid contact lenses. These lenses are different from traditional contact lenses for several reasons. First off, they are often custom made to a patient’s eye, meaning that are not simply pulled off the shelf and off you go. They are carefully fitted by a specialty contact lens fitter (often a residency trained Optometrist) and the parameters are sent to a manufacturer. The end result is a lens that properly fits the patient’s unique cornea and provides significantly better vision and comfort than traditional contact lenses. Secondly, specialty contact lenses are usually not disposable. Due to the tailored fitting process, these lenses are often disposed of bi-annually or annually. Some designs can last significantly longer than a year with proper care. Lastly but most importantly, specialty contact lenses benefit those patients who have been told that contact lenses will not work for them or for those patients who cannot see well in spectacles. These patients include those with high prescriptions, irregular corneas due to disease, scarring or surgery, and dry eye. The bottom-line is specialty contact lens designs can give hope to the hopeless, can provide to vision to the visually impaired and can ultimately change lives for the better! Schedule your specialty contact lens evaluation today.